These communities have been exposed to stress from noise and, air and water pollution. Yet despite these harms, the health of the population has been an after thought in the planning process for many years. 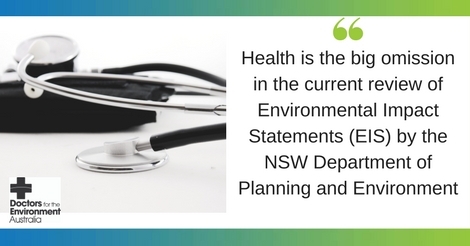 Health is the big omission in the current review of Environmental Impact Statements (EIS) by the NSW Department of Planning and Environment, which has ignored the issue previously. The people of NSW, and particularly the Hunter, are frustrated by the EIS process. On numerous occasions significant community concerns have been ignored. This was seen only recently with the approval of a seven-year extension to the Wilpinjong mine after there were 600 objections (about 100 approving) from the community. There also continue to be applications for mines such as the Rocky Hill coalmine that is within a kilometre of houses. Is there going to be a continued disregard for the health of the population? Robust evidence shows that mines put local communities at increased risk of cardiovascular disease, respiratory illnesses such as asthma, high blood pressure, kidney disease and strokes. But while the primary objective of an EIS is to protect the environment in order to protect community wellbeing, health is never mentioned in the current review. Doctors are deeply concerned about this omission and call for a Health Impact Statement to be done for all major projects. Too often the government acts as proponent of a project instead of arbiter, and health assessment suffers. To ameliorate this appalling situation, a Health Impact Statement must be done by independent experts who have no pecuniary interests in the project. The process must be carried out by a firm that does not derive its income from this type of consultancy, and independent monitoring of the environmental conditions with results made available to the community. The Environmental Protection Agency (EPA) is the ideal agency to undertake this critical task. However, as outlined in the Environment Justice Australia (EJA) report into the toxicity of coal-fired power stations, the EPA needs to be strengthened to protect human health. Ideally, we need a federal EPA independent of state politics and industry influence. Furthermore, each new development needs to have an adequate cost-benefit assessment that includes the costly health externalities of a given project on the local population as well as the costs of emissions enhancing climate change. The Business Council of Australia has been calling for a cost-benefit analysis for many years. The EIS review document highlights the importance of transparency, however, it is not clear how a project will get its final approval. This needs to be articulated. The community is frustrated by the approval process and is often dismayed when a project that is obviously detrimental to local people is given a green light. The NSW Government is wasting its time with the review of Environmental Impact Statements – unless all these conditions are met. Only then can the people of NSW have faith that the government has the community’s health front and centre.